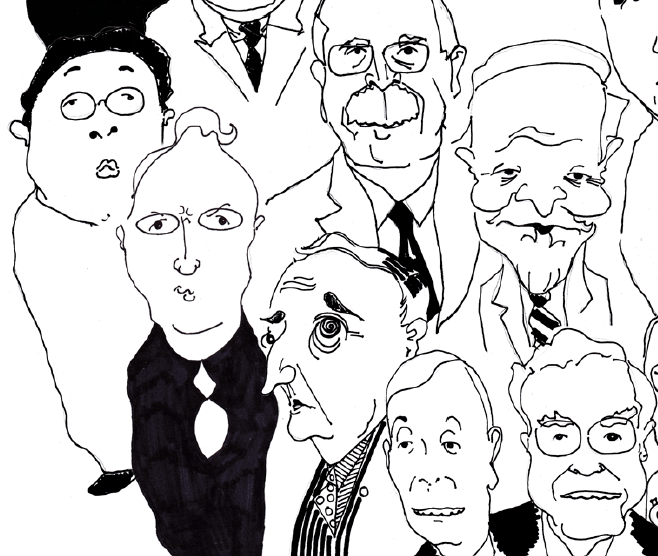 Cartoon figures of leading climate deniers in the “Dealing in Doubt” report. As governments meet in Stockholm this week to finalise the IPCC’s Summary for Policymakers for its Working Group 1 report release, I wonder if they can hear the shouting match going on in the world’s blogosphere and in some media. The bleating of deniers is reaching a cacophony. They are rolling out every single trick they possibly can ahead of the report release. Global warming’s paused and nobody knows why! The IPCC’s halved its prediction! NIPCC report says global warming isn’t happening! But their strategy isn’t going that well: the Daily Mail, Daily Telegraph, The Australian and Australian Telegraph were all forced to retract part of their claims, as they were simply wrong. Bloomberg: The ice at both poles is melting faster than thought. Scientists are also jumping in to explain some of the cherrypicked hysteria, such as this great piece by NSW University climate scientis Dr Andy Pitman in The Conversation. Many others are fighting back as well. But it’s still a debate. And the public is probably still confused. I’ve just finished the latest version of Dealing in Doubt, written for Greenpeace, updated since 2010. The report outlines a history of the attacks on climate science, scientists and the IPCC over the last 25 years. It’s by no means a full account and there are many players and incidents missed. But it gives a flavour of the doubt-dealing strategies, funded by the fossil fuel industry over recent decades. The same tactics they’re rolling out right now. Last week the Heartland Institute (see case study in report) launched its latest version of the “NIPCC” – the “Not the IPCC” report, written by deniers Craig Idso, S. Fred Singer, Australia’s Bob Carter and co-authored by Willie Soon, all part of the “continental army” of deniers who’ve been working together for years. What does it claim? Of course, climate change isn’t happening, we’re not causing it, nothing to see here move right along now everyone (and, as the argument goes, stop government intervention to curtail our use of fossil fuels). Heartland is rolling out its report across the US in the coming months. It claims it’s peer reviewed, but, as Dealing in Doubt outlines, it’s probably more like pal review, one of the ways that deniers are “faking it”. Or maybe their “peer review” is along the lines of the claims made in the Heartland document where many of the scientists whose work they used to back their claims were outraged at the misrepresentation. A colleague went and talked with Heartland about their funding – somehow they were reluctant to talk about who’s backing them. Yet the deniers are still fighting – largely because they’re still being funded. They’re using the same tactics they’ve always used to sow doubt on the climate science. And while the attacks on the scientists are getting worse, some of them are now fighting back. But their impact is diminishing as people see – and experience – the impacts of climate change. The IPCC’s report this week will confirm this, confirm the certainty and confirm the science. The history set out in this report, as well as the prior history of denial by the tobacco companies and chemical, asbestos and other manufacturing industries, is important to remember because the fossil fuel industry has never admitted that it was misguided or wrong in its early efforts to delay the policy reaction to the climate crisis. To this day, it continues to obstruct solutions.